The Industrial Internet of Things (IIoT) and smart manufacturing are two parallel developments driven by the same core technology advances – the ubiquitous connectedness and widespread computation – that drive and are driven by the internet, and the seamless information sharing and optimal decision-making they enable. IIoT is about connecting the industrial assets, such as machines and control systems, with the information systems, with the people who are running it or using it, and with the business processes. Built on the connectiveness, we can collect large amount of data, apply advanced analytics on them to gain operational insights. With this new level of insights, we can broadly enable optimal decision-making to drive intelligent industrial operations, from there to create new business values and even to seek transformational business outcomes. On the other hand, Smart manufacturing seeks to fully integrate manufacturing systems and processes that are optimized by information, with a clear goal, to dynamically respond to changes in demands, in the supply chain, and in the condition of the assets – a key focus of the Industrial Internet. Clearly a test of such responsiveness is the capability of customized mass production. A clear path to achieve smart manufacturing is though digitalization, or the convergence of operational technologies (OT) with the information technologies (IT) – to be more exactly, the application or adaption of the latest information and internet technologies in the operational or manufacturing domains based their stringent requirements. Simply put, as long as we are dealing with physical objects and machines, IIoT applies. Clearly, smart manufacturing can benefit from IIoT as a part of its digitalization of the manufacturing processes and their integration. The success in Smart manufacturing would in turn helps IIoT implementations in other industries. Driven by the same technology advances and enhancing each other, therefore, IIoT and Smart manufacturing can be considered as a twin-movement of digitalization or even “internetization”. The “smartness” in IIoT and manufacturing is about making optimal decisions, with and without human in the loop, in the processes in response to changes. To achieve that we need to access to the right information at the right time about the market, about the customers and the workforce, about the processes and finally about the physical assets and their operating environment. Gaining insights about the industrial assets and their operations is the main focus of IIoT. We now have an opportunity to garner these insights from the analytics of the vast amount of data we collect from these assets through the newly established connectivity. Undoubtedly, analytics is an essential mean to achieve the smartness. Naturally, the importance of industrial analytics has been widely recognized by increasing number of industry and business leaders across the globe. Many consider industrial analytics essential for their businesses and want to make analytics – especially those related to physical objects and machines such as predictive and prescriptive analytics – a high priority to strengthen their businesses within the next few years. This may not be that surprising – for industrial companies, manufacturing included, equipment are among their most important value-creation assets. How to keep them running, running efficiently are therefore crucial. Therefore, IIoT is more than just connecting up the machines. It is about building on that connectivity to apply data analytics to gain insights, to transform these insights into actions and apply these actions to the machines and control systems, to the operations of fleets of machines and to the business processes – for the goal of enabling end-to-end intelligence in the overall business to achieve optimal business outcomes. To sum it up, the IIoT is about enabling intelligent processes driven by actionable insights from analytics. From these considerations, it is not too exaggerate to say that data is the new fuel in our new industrial age, and analytics is the new engine that drives intelligent processes, optimize systems and inform business strategy. The digitalization of the manufacturing processes is not a new movement but a journey started, coincided with the development of computers, in the digitization of the automation systems and manufacturing process functions as MC (micro-controller), PLC (programmable logical controller), ERP (enterprise resource planning), PLM (product lifecycle management), MES (manufacturing execution system), various CAD (computer aided design) tools emerge. It then moved toward integrating these functions into holistic processes. Now we are at the junction of starting enabling intelligence and eventually autonomy in these processes and systems, as they becoming increasingly capable of context-aware, self-learning, automatically making optimal decisions in response to changing objectives and conditions, in that process transforming the human role from operational to mission-control. The continuing integration of manufacturing processes are required to build the foundation. The advent in the industrial Internet, industrial analytics and the cyber-physical systems (CPS), along with technologies such as artificial intelligence, will play major roles in propelling manufacturing advancing toward the next stage. In essence, the key to success in this endeavor is to be able to orchestrate and optimize business and manufacturing processes, starting from the smart CPS components, to digital products, machines, production lines and within a factory, and across factories, through the entire product lifecycle and value chain. To do that, many manufacturing enterprises have established comprehensive digital processes in the manufacturing environment. Let’s take a representative summary look at them in Figure 1. First, most enterprises have, at various degree, established the so-called, value chain, consisting of functions largely provided by ERP, which may include order fulfillment, production planning, material and supply, to delivery and distribution, and customer support and services, represented in the mostly green vertical stack in Figure 1. The value chain is business execution oriented and concerns about what, when and how many products to produce. Its main objective is to be able to rapidly and optimally respond to market demands and changes in the supply chains and, increasingly, the capability of multi-product small-batch customized mass production in some sectors. Secondly, many enterprise, especially those in sectors with complex products with short innovation cycles, have in some shape and form built the so-called product chain, encompassing product design, process planning and production engineering, as represented in the blue horizontal blocks in Figure 1. It provides the answer on how to produce. Its main objective is the ability of introduction of more diverse, more sophisticated products in a shorter innovation cycles. 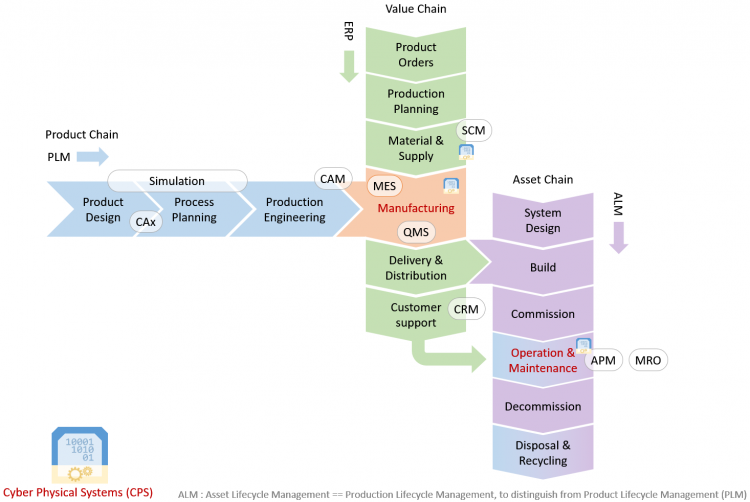 At the junction of the value chain and product chain, the management of actual processes of manufacturing at the plan level, more and more implemented as Manufacturing Execution System (MES), plays a pivotal role as it manages the core asset of manufacturing enterprises – its production capability and resources in the shop floor. Its main objective is to achieve high performance and quality at low cost by dynamically optimizing the deployment of production resources. Lastly, we have this so-called asset chain consisting of the processes for establishing, operating and maintaining the industrial assets, especially those large and high value equipment such as wind turbines, locomotives, port-crane systems, power generation and distribution systems, and oil and gas production systems – after the manufacturers deliver their products to their customers on locations that are deployed and in operations. These products become the value-creation asset of manufacturers’ customers. How to best operate and maintain these assets is the major concern and a main theme of the industrial internet outside of manufacturing. With the advent of smart products, products may remain connected back to the original manufacturers. This new connectedness provides an opportunity to the equipment manufactures to offer value-added services by capitalizing their deep insights with the product to help their customers to create higher value from the installed equipment, in turn generating new revenue streams for the manufacturers, just as the GE PowerUP wind turbine program has demonstrated. Through this process, manufacturers have a new opportunity to extend their business model from a simple product seller to service or value providers. Dr. Shi-Wan Lin is the CEO and a co-founder of Thingswise, LLC, a startup providing streaming industrial analytics solutions purposely built for IIoT systems and Smart Manufacturing – as a turnkey solution adapting and innovating key IT technologies to meet OT’s stringent requirements in reliability, performance and security, deployable from the edge to the cloud. Dr. Lin co-chairs various technical groups for the Industrial Internet Consortium (IIC), the Architecture Joint Task Group between Plattform Industrie 4.0 and the Industrial Internet Consortium and the National Institute for Standards & Technology (NIST) Cyber-Physical Systems Public Working Group. Dr. Lin is a lead editor and contributor to the Industrial Internet Reference Architecture published by IIC. Previously, he worked for Intel for 10 years last as a Principal Engineer/Technologist in the Strategy and Technology Office in its Internet of Things Group and before then Sarvega, Inc (a Web Service/SOA/Security startup), Lucent Technologies and Motorola. Dr. Shi-Wan Lin has 20+ years’ experience in system architecture, Big Data, analytics, enterprise software, Cloud Service, system security and trust, telecommunications and wireless data communications. The opinions expressed in this series of blog reflect his personal view and observations and he is solely responsible for them. Re: Design thinking is not only about products, but processes as well. What are the essential differences in approach?